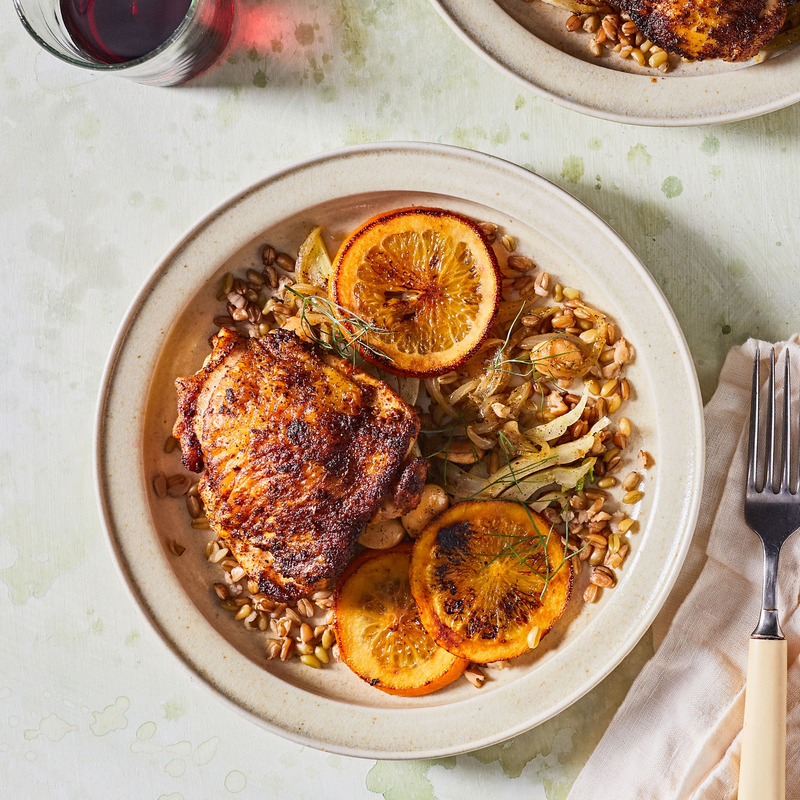 This seasonal dish of hormone-free, cage-free, seared chicken thighs with roasted fennel, onions and orange gets its flavor from a North African spice blend Ras El Hanout, a heady combination of cinnamon, turmeric, ground ginger and saffron. This beautiful combination is served atop freekeh, a young, green, cracked wheat with a texture similar to bulgur, a nutty flavor, and a healthy dose of fiber. Ingredients: Hormone-Free Cage-Free Chicken, Freekeh, Fennel Bulb, Onions, Almonds, Grass Fed Butter, Orange, Canola Oil, Garlic Clove, Organic Thyme, Kosher Salt, Organic Paprika, Organic Black Pepper, Organic Cinnamon, Organic Turmeric, Organic Cumin, Organic Orange Peel (Zest), Organic Ginger, Organic Cayenne Pepper, Organic Saffron. Contains: Milk, Tree Nuts, Wheat.